Recipients of the Thurston Green Business recognition program were announced at the Chamber’s Annual Thurston Green Business Awards & EXPO Forum on Wednesday, April 10 at the Hotel RL Olympia. The event’s keynote speaker was Rachael Taylor-Tuller, owner of Lost Peacock Creamery. Rachael shared a moving story of growing Lost Peacock Creamery, a Grade A Goat Dairy in Olympia, Washington. Lost Peacock is committed to creating an environment that sustains without sacrificing the land and is a certified Animal Welfare Approved farm. Emcees for the event were Thurston Green Business co-chairs: Rachael Jamison from the Port of Olympia and Christine Hoffmann, from Puget Sound Energy. 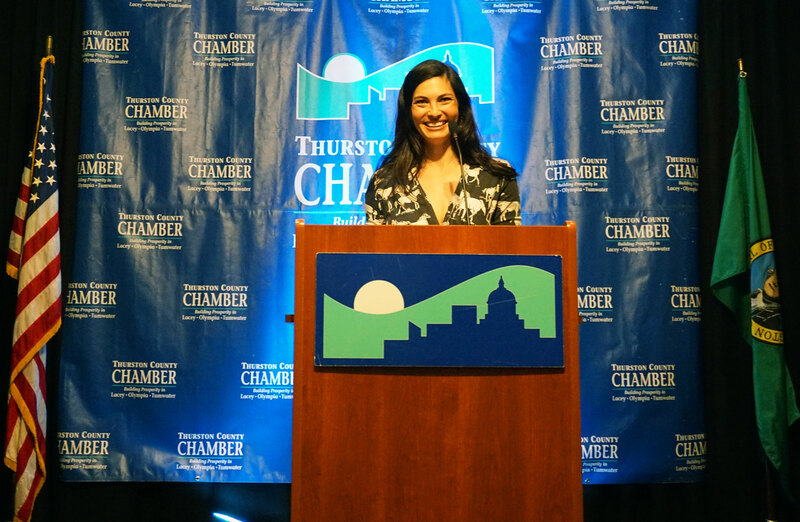 This year, the Thurston Green Committee recognized 91 Thurston County businesses as Thurston Green designees, and recognized four for their outstanding efforts. “The Thurston Green Business program facilities sharing sustainability best practices between public and private entities, and we saw this at work yesterday. Green business practices and business success go hand-in-hand,” said David Schaffert, Thurston Chamber President/CEO.